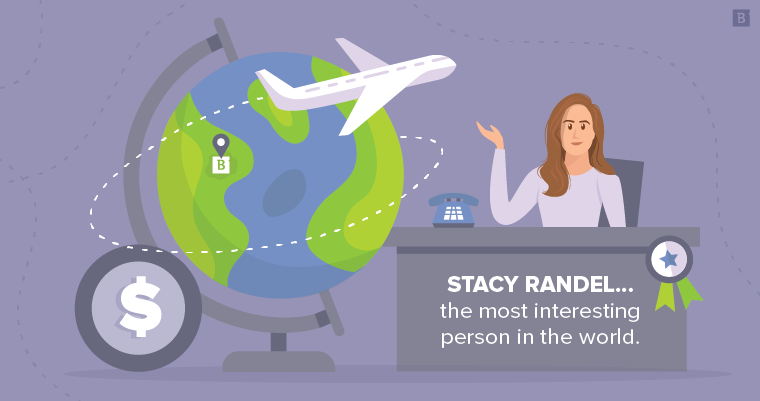 Brafton’s Associate Vice President of Sales, Stacy Randel is, to put it mildly, well-traveled. She’s lived in the UK and Germany, trekked across Central Asia, sojourned in Italy, gazed upon the Berlin Wall (from the Soviet side!) and hopscotched her way all over the U.S. With that extensive global experience – not to mention her sterling track record of success in sales, real estate and international business – it’s a minor miracle that she found her way to Brafton’s Boston offices. But find her way here she did, and Brafton is far better for it. Stacy’s not just an absolute master in the art of sales, she’s an amazingly supportive manager, professional mentor and cheerleader of all things creative. She doesn’t just sell Brafton’s services; she sells our company’s vision. To fully understand her journey, and how Stacy landed at Brafton, we need to go back to the beginning. Growing up in Newton, Massachusetts, outside of Boston, Stacy had several passions – but writing and learning foreign languages quickly stood out above the rest. The former would come in handy at a few points in her life, from contributing an article to The New York Times to serving as a leader in the sales department of this very content marketing firm. The latter would take her all over the world and expose her to a number of different cultures. But first, there was a little matter of college. Stacy studied economics and political science at Yale University, along with Russian and Mandarin. She had already taken Latin and Spanish classes in high school, so she was pretty far ahead of the curve. After graduating, she worked as an analyst at Goldman Sachs in New York and Boston before heading overseas. Stacy’s work took her to London and then on to Eastern Europe where she worked in capital markets. Beyond the rare opportunity to see life within the Soviet Union firsthand, it also gave Stacy the chance to finally show off those Russian chops. Not even a career jet-setting across Europe and the old Soviet bloc could satisfy Stacy, however, and after a while she came back to the States. Although not for long. Wanderlust struck after about a year, and Stacy headed to Munich to learn German and teach Business English. Three years later, Stacy headed back home and trained to become a Feng Shui consultant. For a number of years, she counseled business clients on the finer points of geomancy. As a result, Stacy picked up a thing or two about staging rooms, which led her to the next career change (can you sense a recurring theme here? ): real estate. In particular, Stacy joined up with a software company that specialized in realtor tools like creating virtual tours of homes. That led to a 7-year stint working directly with a lead generation team and spearheading the organization’s sales efforts in various markets like New England, California and Canada. She even got her real estate license during this time with the notion of getting into the real estate game herself. But it wasn’t to be, because in 2014, Brafton’s former Chief Sales & Marketing Officer, Allen Schweitzer, reached out about an opportunity to join our sales management team. Stacy was new to the digital and content marketing game, but she was immediately intrigued by the industry and its long-term trajectory. I’m all about helping people succeed. Before signing on the dotted line, though, Stacy made a deal with her new employers: She would hold off on taking the official job responsibilities of Sales Director until she got down in the trenches and closed five sales. She was coming into a situation where she would be managing a very tenured team (Brafton’s BDEs currently have 8-10 years of experience), and Stacy felt it was important to earn their respect by showing that she herself could do exactly what she expected of them. Stacy had already achieved so much success in her career and professional life before joining Brafton, and she wants to share all of that accumulated knowledge, experience and wisdom with her co-workers and team members. Most of all, she loves doing whatever she can to help those around her grow as professionals. “I know how to sell and I love sales, but at this point in my life, I’m all about helping people succeed,” she says. When team members have had the opportunity to take that next step in their careers, Stacy has always been incredibly supportive, even if that meant them moving on to other departments or companies. “To me, the definition of success is when your employees have learned enough and grown enough that they have the confidence to spread their wings,” she explains. The definition of success is when your employees have learned enough and grown enough that they have the confidence to spread their wings. That doesn’t mean Stacy is content to stand pat with her own career – far from it. She’s constantly looking for opportunities to grow and improve as a professional, which is why she is currently working on getting her masters in organizational leadership from Gonzaga. Stacy’s favorite aspect of working at Brafton is the people – in particular, being able to interact and collaborate with members of different departments all working together on a common goal. With her passion for writing, love of movies and editor’s eye, Stacy has a great deal of respect for the work that Brafton’s designers, videographers, writers and other creatives do on a daily basis. I’ve never worked with such an insanely talented group of people. I just love what we create. So, what’s the secret to Stacy’s incredible success? That strategy has undeniably been a successful approach, and it’s a mindset that Stacy brings to every facet of life, whether she’s chatting with a sales prospect or helping a team member advance their career. It may sound simple, but it all comes down to execution, and no one does it better than her.